Socialization is known as the process of inducting the individual into the social world. It is the process through which a person, from birth through death, is taught the norms, customs, values, and roles of the society in which they live It is the means by which human infants begin to acquire the skills necessary to perform as functioning members of their society. 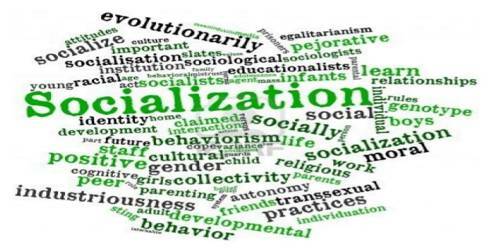 The term socialization refers to the process of interaction through which the growing individual learns the habits, attitudes, values, and beliefs of the social group into which he has been born. This process serves to incorporate new members into a society so that they and it can function smoothly. It is guided by family, teachers and coaches, religious leaders, peers, community, and media, among others. Socialization is the process by which a person learns to be a member of a group, community, or society. Its purpose is to incorporate new members into social groups, but it also serves the dual purpose of reproducing the groups to which the person belongs. Without socialization, we would not even be able to have a society because there would be no process through which the norms, values, ideas, and customs that compose a society could be transmitted. It is through socialization that we learn what is expected of us by a given group or in a given situation. In effect, socialization is a process that serves to preserve social order by keeping us in line with expectations. It is a form of social control. The goals of socialization are to teach us to control biological impulses as children, to develop a conscience that fits with the norms of society, to teach and develop meaning in social life (what is important and valued), and to prepare us for various social roles and how we will perform them.